CCMC is pleased to announce that Kevin Pollock (Terravita, AZ), Lisa Lundskow (Estrella, AZ), Sharon Bolinger (Red Rock, NV), Joe Cook (Central Division Vice President) and Dave Houston (Coral Canyon, UT) have all joined the elite group of community association managers who have earned the Professional Community Association Manager® (PCAM®) designation. 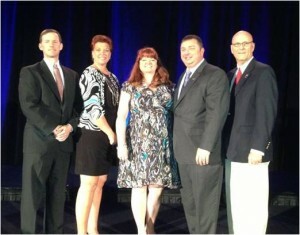 They were pinned last night at the Community Associations Institute (CAI) National Conference in San Diego, California. Over the past thirty years, Community Associations Institute (CAI) has awarded the coveted PCAM® to the top 5% of managers in the country. To earn the PCAM® designation, managers must have five years of industry experience, complete more than 100 hours of course work and submit a satisfactory case study. Please join us in congratulating Kevin, Lisa, Sharon, Joe and Dave on this significant achievement.